Oriental Rug Spa offer a specialist Persian, Oriental and Contemporary rug cleaning in Effingham. We also offer a rug repair service. If you own a dirty or soiled rug that needs professional cleaning, then why not give us a call on 01276 423150. You can drop the rug into our wash facility or arrange a time for us to collect from you. Khal Mohammadi rugs are very distinctive in design and colour. The rugs are woven using a very distinctive shade of red and pattern. Khal Mohammadi rugs are constructed using wool fibres and wool foundation. They are tightly woven compared to most Afghan rugs and are prone to buckling and it can be rare to see one which lies completely flat. Khal Mohammad is the designer and master weaver who is responsible for such rugs. He originates from Turkmenistan from the Ersari tribe, and these influences can be found in his pieces. Most of the rugs are produced in Afghanistan. Usually rugs are given the name of the town or city where they were woven, but unusually these rugs are given the name of the weaver. Khal Mohammadi rugs are also very distinctive in appearance due to the lustre and shine of the wool. 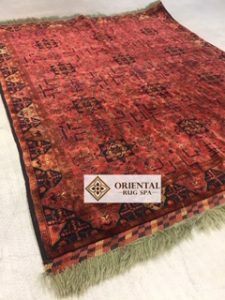 The pile is very short and the rugs are finely woven and considered one of the best Afghan rugs available today in terms of durability and quality.